Leaf: few to many, +- open-rosetted, 3--13 cm, thread-like to narrowly lanceolate, entire, tapered to base, tip obtuse. Inflorescence: 1-flowered (or 2--3-flowered cyme); flowers +- exserted from leaves; bracts 2, below stem middle, 6--18 mm, erect, lanceolate, margins entire, translucent; pedicel 10--40 mm. 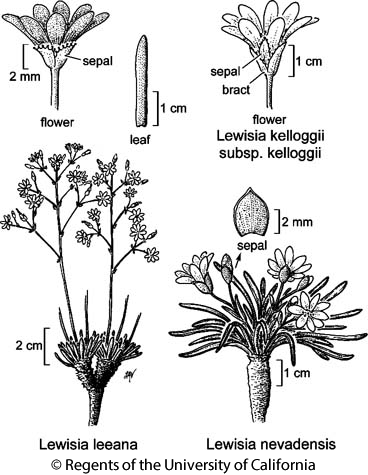 Flower: sepals 2, 1/2--2/3 × corolla, widely ovate, entire to +- jagged (obscurely or irregularly toothed), tips +- acute, spreading; petals 5--10, 9--20 mm, +- obovate, white or pale-pink, tips blunt or +- pointed; stamens 6--15; stigmas 3--6. Fruit: 5--10 mm. Seed: 20--50, 1.3 mm. Chromosomes: n=28. Ecology: Grassy meadows, moist gravel flats, open forest; Elevation: 1300--3000 m. Bioregional Distribution: KR, NCoRH, CaRH, SNH, TR, PR, Wrn, SNE; Distribution Outside California: to Washington, Rocky Mountains. Flowering Time: May--Aug Note: Hybridizes with Lewisia triphylla. Citation for this treatment: John M. Miller & Lauramay T. Dempster 2012, Lewisia nevadensis, in Jepson Flora Project (eds.) Jepson eFlora, http://ucjeps.berkeley.edu/eflora/eflora_display.php?tid=30836, accessed on April 19, 2019. KR, NCoRH, CaRH, SNH, TR, PR, Wrn, SNE; Markers link to CCH specimen records. Yellow markers indicate records that may provide evidence for eFlora range revision or may have georeferencing or identification issues. Purple markers indicate specimens collected from a garden, greenhouse, or other non-wild location.